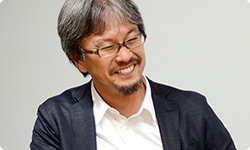 Aonuma-san, what was your motivation for making The Legend of Zelda: Ocarina of Time 3D? As I alluded to when I introduced myself earlier, I wanted to do something about the Water Temple. Everyone talks about it, so it’s been a longstanding wish of mine these 13 years! No matter how much praise The Legend of Zelda: Ocarina of Time has garnered, the Water Temple has always been an issue - like a bone caught in your throat for 13 years. Yeah! That was my prime motivation. But when it came to understanding players’ memories of the original game, each person on the development staff had his or her own thoughts too, so it was hard finding the right balance for each issue. We set some priorities and tried to fix things that should be fixed. I suppose there were things you wanted to fix the first time around but couldn’t. What solved that splendidly this time was the Touch Screen. There are button icons in its four corners. You press them with your fingers. That had a direct effect on gameplay and now it’s extremely comfortable. with two screens, changing items and checking the map would be much easier . The Nintendo 64 system had six buttons, whereas the Nintendo 3DS system only has four. In order to solve the problem of not enough buttons, Grezzo formed a DS Touch Screen Testing Team soon after development began. They didn’t waste a moment! They had begun work even before we had the specifications together. Tonooka-san, was it your idea to put buttons in the four corners? Yes. The first thing that came to mind when I heard about the project was the difference between the upper and lower screens, so on the bullet train on the way back, I thought, “We should look into that,” and thought about a way to do so with the Nintendo DS system. So the idea of putting buttons in the four corners of the Touch Screen came from Shimizu-san and our staff. When that went well, I was confident it could work. Ikuta-san, what did you think as The Legend of Zelda: Ocarina of Time see-sawed back and forth between its old and new versions? Since I was involved with the Mario Club, I was able to hear directly the thoughts and impressions of people today who played it. I examined what they said and my own thoughts from when I was immersed in it 13 years ago, and then I talked over possible changes with Grezzo, but the first thing they said was, “This schedule is impossible!” In the end, though, they kept making all the necessary corrections and improvements right up until the end. That’s right. They always pull through. They really do. It’s very reassuring. So when it came to the opinions that came out of the Mario Club, I think it’s great that I was able to consider with Grezzo whether something was really necessary or whether we should leave it the way it was in the original. You didn’t have a relationship in which one side gives orders and the other takes them. And since Grezzo had charge of one of our biggest titles, the whole staff knew they had to release it in a way that would gain the world’s approval. It’s great that even if they said, “We can’t do it,” you knew that they would. It has been reborn for today in such a way that even someone like you, who played the original a lot, is impressed. I feel like what Grezzo thought the game should be like and what the original staff thought synced up perfectly. That was a good aspect of this project.